This storm system, which produced thunderstorms that spawned a tornado in California yesterday, is reminiscent of the system that chugged through the center of the country last week (pictured above). The previous storm led to blizzard conditions east of Denver, severe weather in the Midwest, and roaring winds across the Great Lakes. That system received a good amount of attention because of how absurd it seemed to people with short attention spans. One spot seeing tornadoes, thunderstorms, warm temperatures, and snow all in the same day is cool, yeah!, but that’s how fall works. That’s what the weather should be like in November. We’re supposed to have these huge troughs dig through the country and spawn lows that generate the whole spectrum of weather in one day. Winter does not arrive silently. It’s not supposed to be in the 60s in November outside of the south. As nice as it is, it’s easy for us to forget that this isn’t normal. 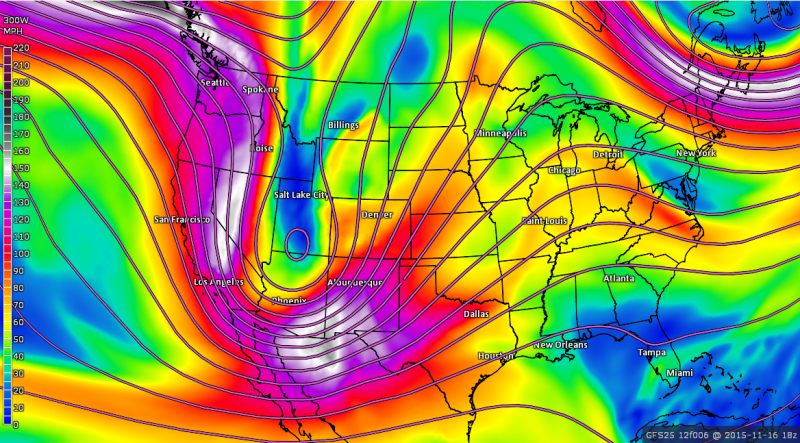 This is what the GFS model says the jet stream looks like early this afternoon. The contours show heights while the colors show winds in MPH. The jet stream is up around 30,000 feet today, give or take a thousand. The trough is so strong that it broke the jet stream, leaving one tendril flapping away up in Canada while the stronger half points its air cannon at the Rockies and central United States. An upper-level low is developing in that trough, and the large-scale lift in the atmosphere will allow a defined surface low to form on the eastern slopes of the Rockies this evening. 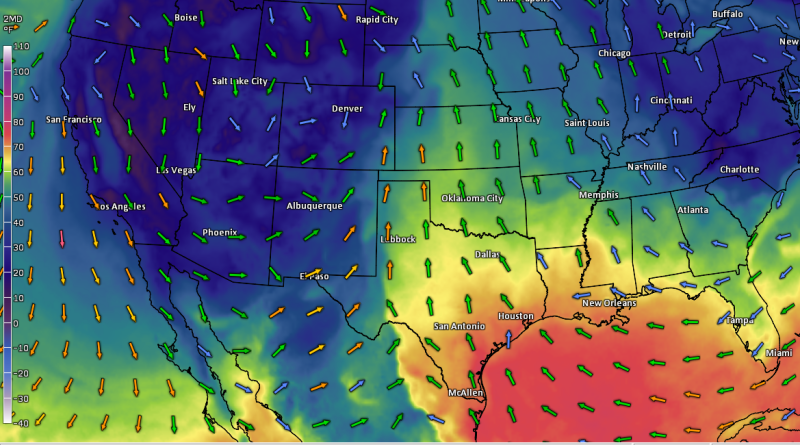 At the surface, warm air and moisture are flowing north from the Gulf of Mexico; above is a map showing surface dew points (warm colors equal muggier air) with surface winds. The forcing from the approaching low, combined with the unstable air over the southern Plains and strong wind shear through the atmosphere, will all come together to trigger nasty thunderstorms across the area today. As a result, the Storm Prediction Center has issued an enhanced risk for severe thunderstorms—a three on a scale from zero to five—across the Texas Panhandle and western Oklahoma. These areas aren’t too terribly populated, but even a town with a few dozen people in the path of a tornado is a a few dozen too many. 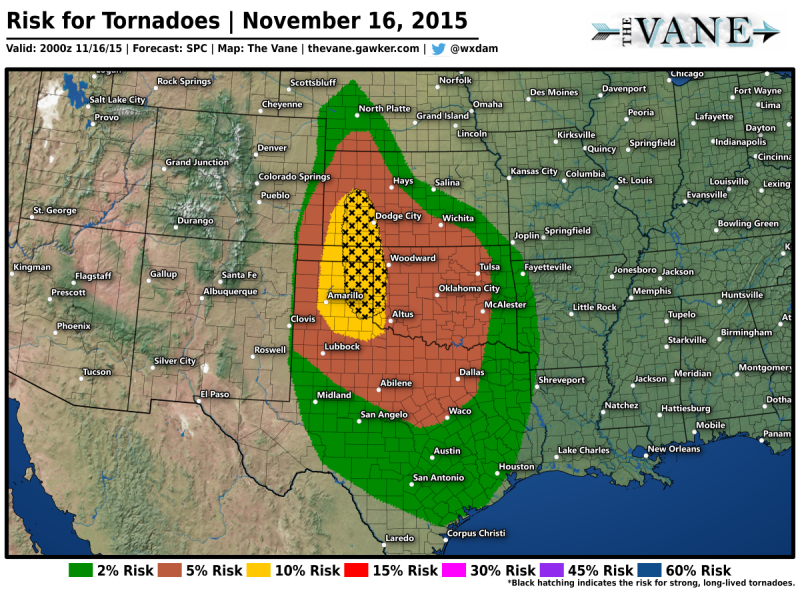 The risk for tornadoes is the headline-grabber of the day, as usual. A 10% risk doesn’t seem like much, but that’d be high on a regular day in spring. Remember, these percentages don’t work like the chance of rain. Tornadoes are much less common than showers, so a lower percent is of greater concern. The black hatching indicates the risk for strong (EF-2+) tornadoes. As we see so many times with severe weather, the risk will come in two rounds. The first round of storms—developing this afternoon—will be discrete supercells, which carry the greatest risk for tornadoes and large hail. As the evening wears on, these storms should congeal into a squall line that moves east, with the threat transitioning to damaging winds with some quick, spin-up tornadoes possible along the leading edge. 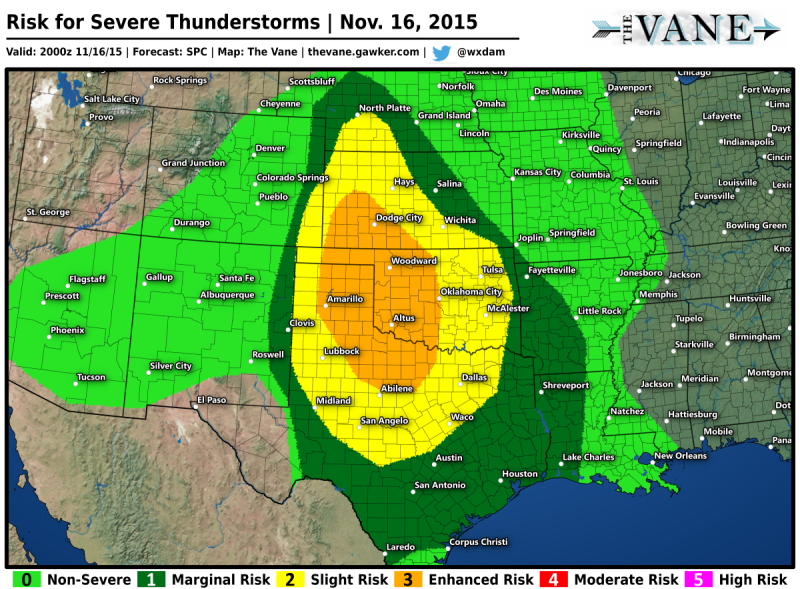 Strong thunderstorms will roll through bigger cities in Oklahoma and Texas late tonight and early tomorrow morning. 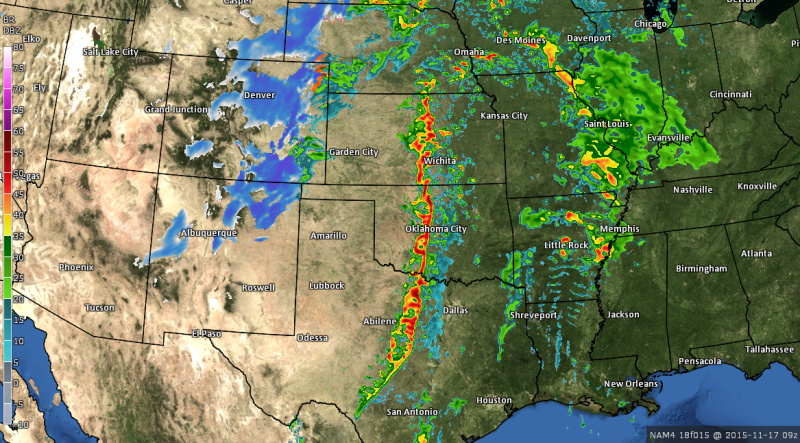 The simulated radar above, from the latest run of the high resolution North American Model, shows where the squall line could be at 3:00 AM CST. Severe weather at night is more dangerous than it is during the day because people aren’t awake to receive alerts. Make sure you have a way to hear a warning if one is issued. The threat for severe weather will shift east on Tuesday, with the northern Gulf Coast taking the brunt of the bad weather. Tornadoes, large hail, and damaging winds are possible there, too, with the most significant storms unfolding across Louisiana and Arkansas. Not only is there a risk for strong severe thunderstorms tomorrow, but the storms that do form will bring very heavy rain to the Deep South and Midwest. Flash flood watches are in effect from the Louisiana coast up through central Illinois in anticipation of up to five inches of rain falling in the period of one day tomorrow. 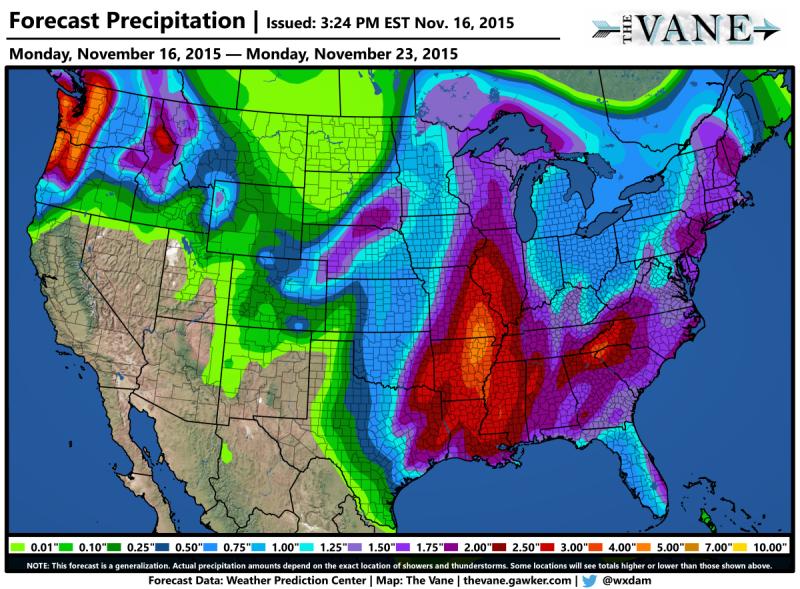 The above forecast from the Weather Prediction Center shows the entire eastern half of the country receiving at least an inch of rain over the next seven days, but most of it will fall before the end of this week. Here’s a riddle: why did the person drive across the flooded road? Because he was an idiot. Don’t be an idiot. If you come across a flooded roadway, turn around and find another route. You cannot accurately judge how deep it is, and it takes a very small amount of water to disable your car and send you to a watery grave. 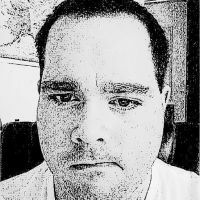 Cheyenne County, Kansas, as of the writing of this post, is under a blizzard warning, a severe thunderstorm warning, and a tornado watch, with an air temperature of 66°F. 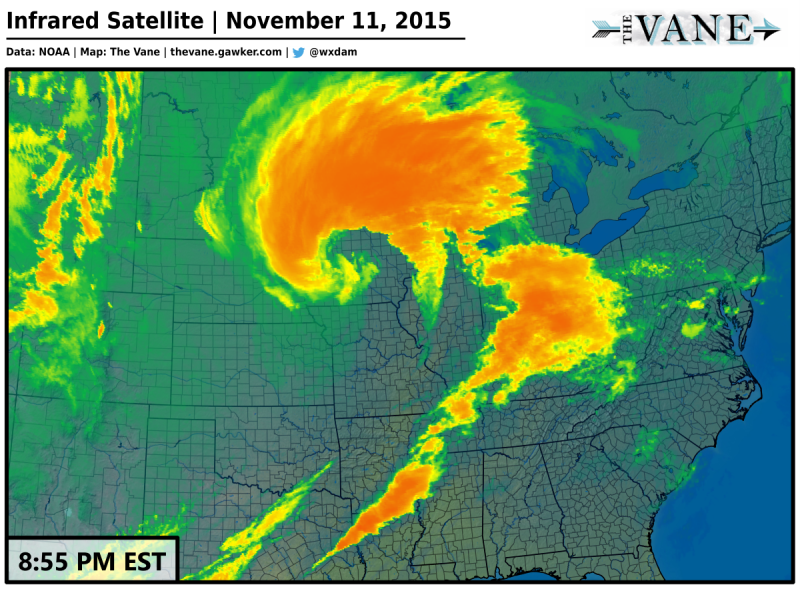 If that doesn’t speak to the awesome nature of these classic November storms, I don’t know what does. The National Weather Service is calling for ten inches of snow in Denver by Tuesday evening, with more than a foot to the south and east of the city and its immediate suburbs. More than two feet of snow could fall on Pike’s Peak and other higher elevations. Snowfall totals will vary greatly from location to location, and areas caught under a persistent, heavier band could see higher totals than currently forecast. Don’t venture outside during the worst of the storm unless it’s absolutely necessary. Whiteout conditions are extremely dangerous both on foot and in a vehicle—you’d be surprised by how easily you can get disoriented and lost in a whiteout, even on your own property. 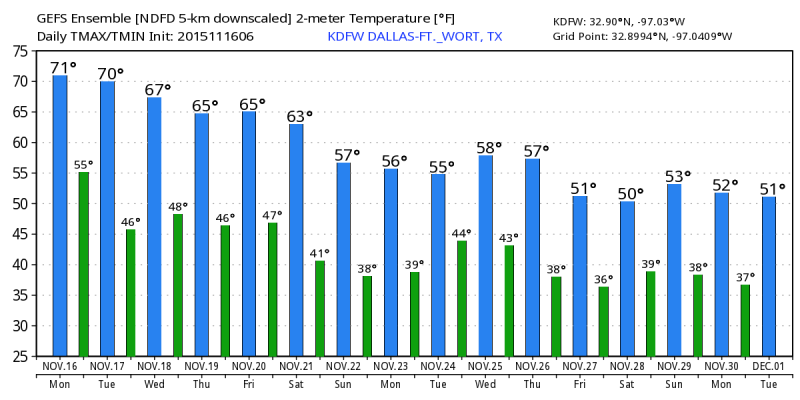 Once the cold front pushes its way through and the weather settles down, temperatures will start to return to a more normal state for the week before Thanksgiving. 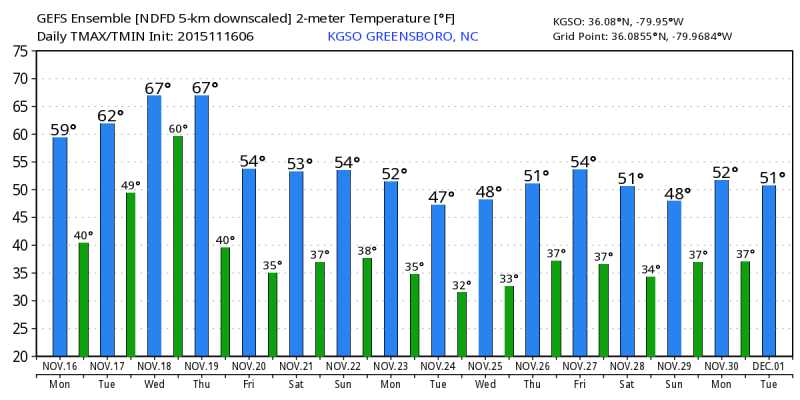 That’s not to say that we won’t see a few more spells of above-average temperatures, but if the GFS model is any indication, our Septemberest November Ever is drawing to an end and the onslaught of cheery music and decorations and movies and fake snow and ho-ho-hoing won’t seem so out of place. 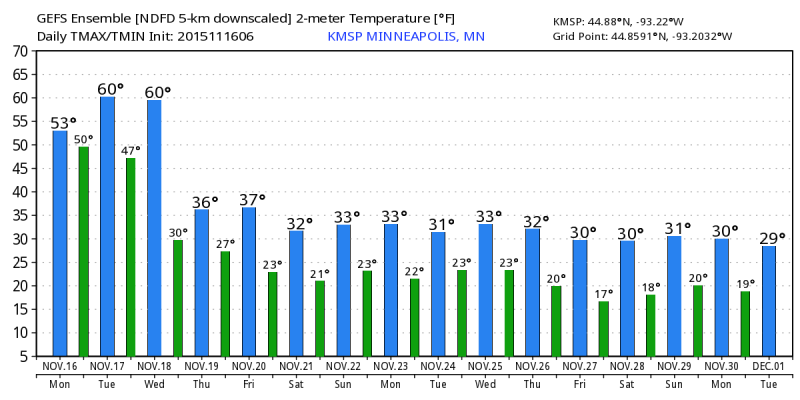 Take a look at the GFS model’s predicted temperature trend in Minneapolis, for example. Fall is dead. Long live fall.